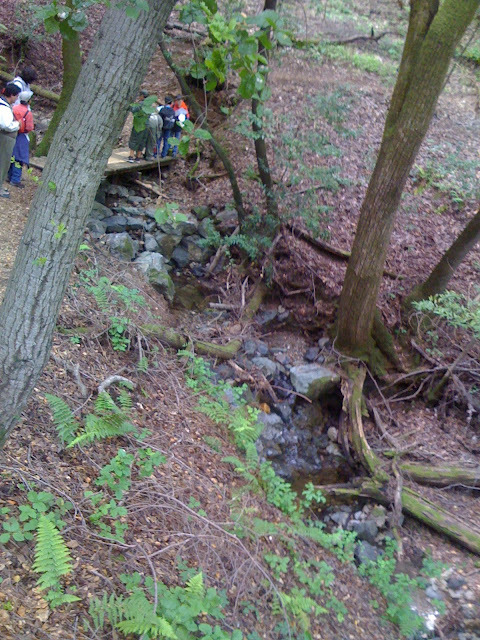 The Scouts were working on orienteering, tracking, and several other skills that I missed because by then my feet were starting to hurt. 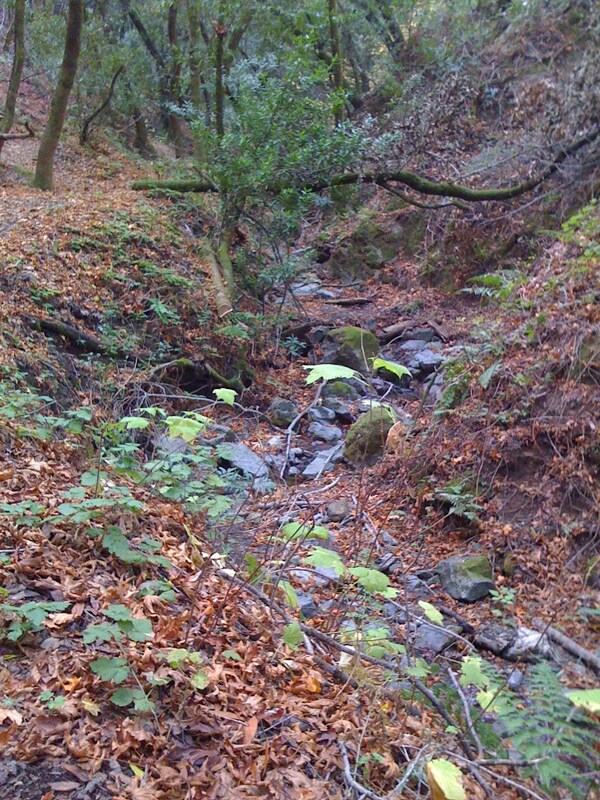 I am going to have to get some real hiking shoes--sneakers were not cutting it. One of the Scout Dads teased me that I was all set to "sneak up" on some wildlife. 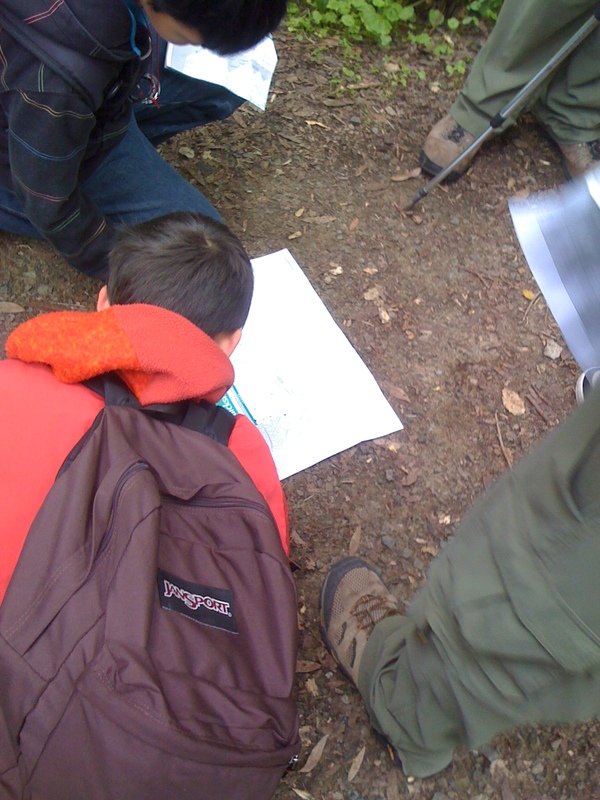 Here the boys are trying to figure out how to read the map. They were learning to set the compass to determine North, then oriented the compass on the map to face the same direction. The trail itself was mostly packed dirt, covered in leaf litter--my favorite texture and smell. Our group was pretty spread out. See how far away they are in this shot. I was in the middle-ish group. There was the Troop leader in front, with his German Shepherd, who whined whenever anyone got in front of her. She liked to lead us all, so we let her. The younger Scouts, Teddy among them, stayed with them pretty well. The adults lagged in the middle, encouraging each other, and 1 or 2 of the Scouts who were less fit and needed more encouragement to keep going. The last group were the Patrol Leader and his friends. They positively dawdled, but seemed un-bothered by the distance between us and them. In the full throes of teen-dom, they were enjoying some alone time, even while out on a hike with adults and tweens. 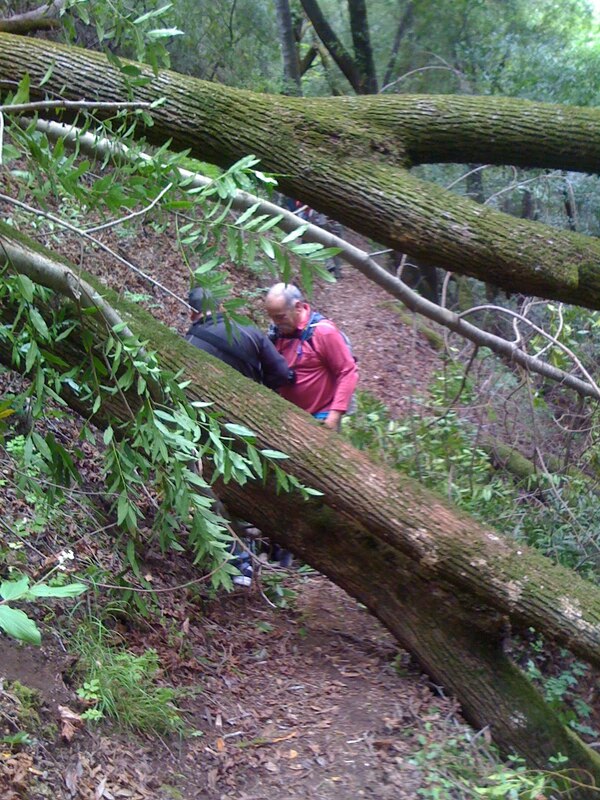 At one point, we all had to scramble over the fallen tree that completely blocked the path. What is not easily visible is that the path is on the side of a hill, and a deep ravine is to the right where the tree continues out of my frame. Our Troop leader is very strong, and he braced each of us so we did not fall off the wrong side of the trunk! Tomorrow I'll show more pictures of why this was all worth the walk.